I have had so much anxiety about sending Elijah to school. The worst was in August before school had even started. I was so worried for him. Worried about bullying. Worried he wouldn't get what he needs. Worried about his inability to tell me if things weren't going well. Just plain worried. Elijah was in a self-contained special-ed classroom for the past three years, but in kindergarten he's in a regular classroom. He does have a special education teacher and classroom too, but he's in the main classroom as much a possible. This idea of mainstreaming was both exhilarating and terrifying to me. Would the other "typical" kids accept Elijah? Would they be nice? Is this even going to work? I get reports on what Elijah does at school, but I've often wondered... how are the other kids reacting to him? Is he accepted? Do they like him? 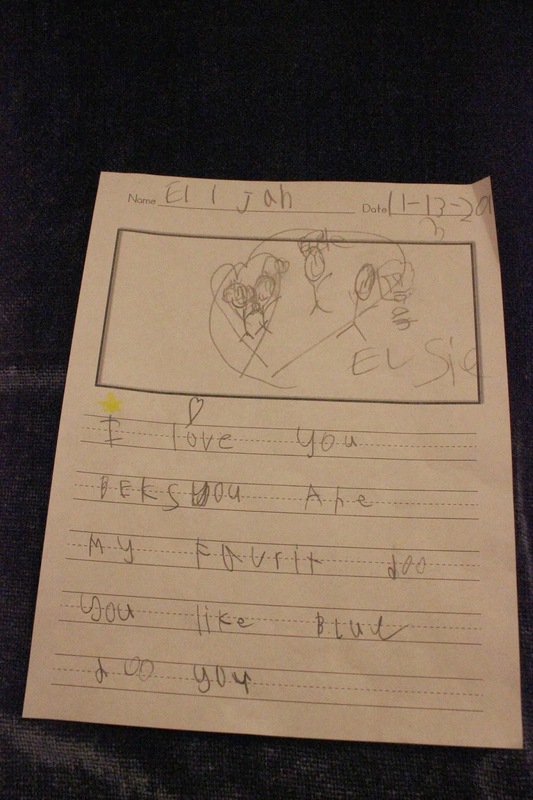 Every day when I get home from picking Elijah up from school, I eagerly open his backpack to read his daily report. Sometimes there's little tidbits such as: "Elijah read with a classmate today" or "Elijah played Candyland with a friend." I tingle with excitement at these notes. A friend. 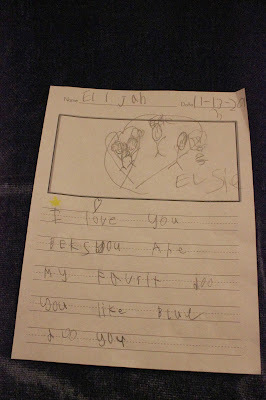 Translation: "I love Elijah and my whole class! Elijah from Elsie"
Close-up of Elijah. I love the details of his glasses and his high-top shoes with long laces. Translation: "I love you because you are my favorite. Do you like blue, do you?" Holding these pages in my hands, I let the tears flow down my cheeks. Elijah is a kindergartner. Elijah is loved. He is accepted. He is exactly where he should be. We hear so much about bullying and mean kids - what about stories such as these? What about big puffy hearts and love? What about this girl's ability to see past Elijah's disabilities to see his awesomeness? I have so much hope for the future.